Football Pools section for a complete list of pools to run during and after the season. Each pool participant is to pick only one team each week and each team can only be picked one time throughout the entire season. In contrast to the Survivor Pool, participants are not eliminated from this Pool when a team picked loses, but instead points are subtracted from their point total. All participants remain in this pool for the duration of the NFL Season. A participant receives points for correctly picking a winning team, for every point their pick wins by they are awarded 1 point. If their pick loses, 1 point for every point they lose by is subtracted from their score. 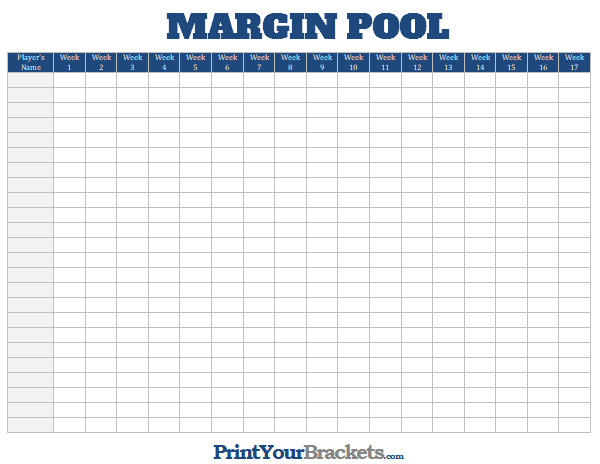 If you look above we have also included a Printable Scorecard for this pool. It is basically a duplicate grid of the actual pool, but has an extra column to add up the total points. Due to the limited space on the grid it is recommended to write the team picks on the original grid and then write down the points scored each week on the scorecard. 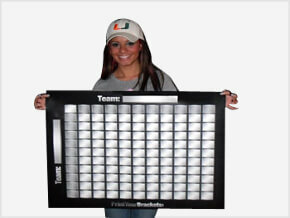 At the end of the season, simply add up each participant's points. The person with the most points wins. Check our our thoughts on Tipping the Office Pool Host. An easy variation to this pool is to not subtract points when a losing team is picked, but instead just have zero points awarded.